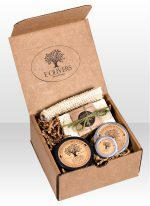 This beautiful gift box has everything you need to pamper and soothe your skin. All products are made in the Finger Lakes in small batches, using our ultra-premium extra virgin olive oil. These totally natural, handmade products provide vitamins and antioxidants that protect and heal even the driest skin. Contains: Extraordinary EVOO Soap, Sumptuous Skin Balm, Luscious Lip Balm, and Sensational Skin Scrub and a natural, sisal bath mitt.